I will add to this document when I get to the second batch of records. Nr. 2. Hoffelde, the 5th of October 1874, before the registrar came the midwife Louise Buss née Pribbernow, resident of Roggow A, evangelical religion, to say that Mrs. Emilie Friedrich née Krein, evangelical religion, resident of Gallnow with her husband the hallmeyer (?) Carl Friedrich from Gallnow, had a child on 2 Oct 1874. Note in margin: Roggow A the 14th of December 1874, Carl Friedrich from Gallnow came to say that the son born on the 2nd of October was named Otto August Arnhold Friedrich. Nr. 3 Hoffelde, the 5th of October, 1874, before the registrar came the midwife Louise Buss née Pribbernow, resident of Roggow A, evangelical religion, to say that Henriette Ostreich née Mallü, evangelical religion, resident in Haseleu with her husband the day-laborer Wilhelm Ostreich in Haseleu, gave birth on 4 Oct 1874 to a daughter. Note in margin: In Hoffelde the 17th of October 1874, the day-laborer Wilhelm Ostreich from Haseleu came to say that the daughter born the 4th of October was named Anna Henriette Ottilie Ostreich. Nr. 4. Hoffelde, the 16th of October 1874. Before the registrar came the midwife Louise Buss née Pribbernow, resident of Roggow A, evangelical religion to say that Henriette Berge, evangelical religion, resident of Haseleu, resident with the miller Kristian Berg of Haseleu, gave birth on 13 Oct 1874 to a daughter. Note in margin: In Hoffelde the 29th of October 1874, Henriette Berg from Haseleu came to say that the child born the 13th of October was a daughter named Antonie Marie Elisabeth Berg. Signed by Augustine Berg. Nr. 5. Hoffelde, the 16th of October 1874. Before the registar came the midwife Louise Buss née Pribbernow, resident of Roggow A, evangelical religion, to say that Augusta Braatz née Kriesen, evangelical religion, resident in Haseleu, wife of Albert Braatz of Haseleu, had a child on 14 Oct 1874 1874. Note in margin: In Hoffelde the 1st of November 1874, Albert Braatz came to say that the child born in Haseleu on the 14th of October was a son named Otto Hermann Carl Braatz. Nr. 19. 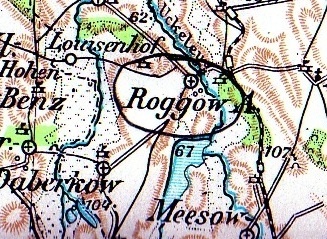 Roggow A, 28th November 1874. Before the registrar came the midwife Louis Buss née Pribbernow, resident of Roggow A, evangelical religion, to say that Wilhelmine Marquardt née Pribbernow, evangelical religion, wife of Friedrich Marquardt, evangelical religion, resident with him in Roggow A, on 27 Nov 1874 had a son. Note in margin: Roggow A, the 30th of December 1874. Friedrich Marquardt of Roggow A came to say that the child born to his wife on the 27th of November was a son named Johann Friedrich Wilhelm Marquardt. Signed by Friedrich Marquardt. Nr. 21. Roggow A, the 4th of December 1874, before the registrar came the Miller(?) Johann Buss, resident of Meesow, evangelical religion, to say that Bertha Buss née Pribbernow, his wife, evangelical religion, resident with him in Meesow, gave birth on 3 Dec 1874, to a daughter named Martha Helene Johanne Buss. Nr. 1. Roggow A, 11th January 1875, before the registrar came the bauer (farmer) Friedrich Pribbernow, resident of Meesow, evangelical religion, to say that his wife Johanne Pribbernow née Völz, evangelical religion, resident with him in Meesow, gave birth on 4 Jan 1875 to a daughter named Christiane Martha Elisabeth Pribbernow. Nr. 1. Roggow A, the 10th of March 1875, before the registrar came Johann Friedrich Erdmann Pribbernow, evangelical religion, 37 years old (b 1838), born in Meesow, resident of Meesow, son of the bauer Christian Pribbernow and his wife Dorothea Sophie née Steffen, and Miss Bertha Helene Ulricke Buss, evangelical religion, 19 years old (b 1856), born in Meesow, resident of Meesow, daughter of the bauer Friedrich Wilhelm Buss and his wife Dorothea née Degner. Witnesses: Wilhelm Buss, 54 years old, resident of Meesow, and the schneidemeister Albert Grams, 42 years old, resident of Meesow. Signed Johann Pribbernow, Helene Buss, Wilhelm Buss, Albert Grams. Nr. 24. Roggow A, the 7th of April 1875, before the registrar came the tischlermeister (master furniture-maker) Friedrich Hoppe, resident of Roggow A, evangelical religion, to say that his wife Wilhelmine Hoppe née Pribbernow, evangelical religion, resident with him in Roggow A gave birth on 5 Apr 1875 to a son named Hermann August Friedrich Hoppe. Nr. 5. Roggow A, the 3rd of June 1875, before the registrar came Johann Friedrich Wilhelm Pribbernow, evangelical religion, 21 years old (b 1854), born in Meesow, resident of Meesow, son of the Altstitzer Johann Pribbernow and his wife Friedericke née Buss from Meesow, and Miss Karoline Friedricke Henriette Wienke, evangelical religion, 20 years old (b 1855), born in Meesow, resident of Meesow, daughter of Johann Wienke and his wife Anna Marie née Pribbernow from Meesow. Witnesses: the Eigentümer Wilhem Buss, ?? years old, resident of Meesow, and Johann Wienke, 30 years old, resident of Meesow. Signed Johann Pribbernow, Henriette Wienke, Wilhelm Buss, Johann Weinke. Nr. 10. Roggow A, the 12th April, 1875, before the registrar came Hermann Schulz, resident of Meesow, to say that the alsitzer Friedrich Schulz, 74 years old (b 1801), evangelical religion, resident of Meesow, born in Meesow, husband of the deceased Louise née Buss, son of the büdner Johann Schulz and his wife Louise née Pribbernow of Meesow died 11 Apr 1875. Signed and witnessed by Hermann Schulz. Nr. 59. Roggow A, the 17th of August 1875, before the registrar came the ?? Wilhelm Sens resident of Daberkow, evangelical religion, to say that his wife Johanne Sens née Schulz, evangelical religion, resident with him in Daberkow, gave birth on 13 Aug 1875 at 10am to a son. Note in margin: Roggow A the 12th of October 1875, Wilhelm Sens came to say that the child born on 13 Aug 1875 was named Hermann Otto Robert Sens. Nr. 84. Roggow A, the 12th December 1875, before the registrar came Johann Pribbernow, resident of Meesow, evangelical religion, to say that Helene Pribbernow née Buss, his wife, evangelical religion, resident with him in Meesow gave birth on 10 Dec 1875 to a daughter named Marie Auguste Elisa Pribbernow. Signed and witnessed by Johann Pribbernow. Nr. 1. Roggow A, the 22nd January 1875, before the registrar came Wilhelm Buss, resident of Meesow, to say that Friedrich Wilhelm Buss, altsitzer (person on life estate), 67 years old (b 1808), evangelical religion resident of Meesow, born in Meesow, husband of Anna Sophie née Pribbernow, son of the altsitzer Christian Buss and his wife Louise née Pribbernow, died on 21 Jan 1875. Signed by Wilhelm Buss. Nr. 9. Roggow A, the 1st of April 1875, before the registrar came the altsitzer (person on life estate), Johann Pribbernow, resident of Meesow, to say that Friedricke Pribbernow née Buss, 58 years old (b 1817), evangelical religion, resident in Meesow, born in Meesow, daughter of the farmer Johann Friedrich Michael Buss of Meesow, and his wife Anna Buss, died on 31 Mar 1875. Nr. 32. Roggow A, the 29th of April 1876, before the registrar came Johanna Friedrike Boldt née Callwitz, resident in Meesow to say that Johanne Pribbernow née Bütz, evangelical religion, wife of ?? Friedrich Pribbernow, evangelical religion, with her husband, in Meesow, on 23 Apr 1876 gave birth to a son named Gustav Friedrich Albert Pribbernow. Nr. 64. Roggow A, the 8th September 1876, before the registrar came Johann Pribbernow fo Meesow, evangelical religion, to say that Henriette Pribbernow née Wilhelm his wife, evangelical religion, resident with him in Meesow, gave birth on 4 Sept 1876 to a son, unnamed. Note in margin that on the 1st of October Johann Pribbernow of Meesow came to say that the child born on the 4th of September was a son named Albert Friedrich Wilhelm Pribbernow. Nr. 75. Roggow A, the 25th of October 1876, before the registrar came Wilhelmine Pribbernow née Schulz (Schwarz? ), resident of Roggow A, evangelical religion to say that Wilhelmine Hoppe née Pribberhow, evangelical religion, wife of Friedrich Hoppe, evangelical religion resident with him in Roggow, on 24 Oct 1877, gave birth to a daughter, no name. Note in margin that on the 21st of November 1876, Friedrich Hoppe of Roggow A reported that his daughter born on the 24th of October was named Martha Wilhelmine Auguste Hoppe. Nr. 9. Roggow A, the 22nd Mar 1876, before the registrar came Christian Friedrich August Pribbernow, evangelical religion, born 7 Apr 1838 in Meesow, resident of Meesow, son of Johann Friedrich Pribbernow and his wife Friedericke née Buss, resident in Meesow, and Emilie Friedricke Auguste Krause, evangelical religion, born 9 Jun 1853 in Braunsforth, resident of Braunsforth, daughter of the eigentümer Carl Krause and his wife Friedericke née Nicolaus, resident of Braunsforth. Witnesses: The eigentümer Wilhelm Utecht, 55 years old, resident of Roggow A, and Johann Schellin 37(?) years old, resident of Roggow A.
Nr. 31. In Roggow A, the 19th of December 1876, before registrar came Carl Friedrich Ludwig Frömming, evangelical religion, born the 3rd of March 1851 in Muhlendorf, resident in Muhlendorf, son of Friedrich Frömming and his wife Wilhelmine née Bretzke, resident in Muhlendorf, and Bertha Auguste Emilie Bielke, evangelical religion, born 10 May 1857 in Margarethenhof, resident in Margarethenhof, daughter of Friedrich Bielke and his wife Auguste née Hanke, resident in Margarethenhof. Witnesses: Johann Pribbernow, 34 years old, resident of Meesow, and Wilhelm Steinhorst, 34 years old, resident of Neukirchen. Nr. 7. Roggow A, the 21st of January 1877, before the registrar cam the laborer Albert Sager, resident of Meesow, evangelical religion, to say that his wife Wilhelmine Sager née Sens, evangelical religion, resident with him in Meesow, gave birth on the 14th (?) of Jan 1877 to a girl named Hedwig Auguste Helen Sager. Signed and witnessed by Albert Sager. Nr 37. Roggow A the 6th of June 1877, before the registrar came Johann Buss, resident of Meesow, evangelical religion, to say that his wife Bertha Buss née Pribbernow, evangelical religion, resident with him in Meesow, gave birth on 31 May 1877 to a daughter named Agnes Marie Sophie Johanna Buss. Signed and witnessed by Johann Buss. Nr. 58. Roggow A, the 14th of August 1877, before the registrar came Johann Pribbernow, resident of Meesow, evangelical religion, to say that his wife Helene Pribbernow née Schulz, evangelical religion, resident with him in Meesow, gave birth on the 13th Aug 1877 to a son named Wilhelm Gustav Albert Pribbernow. Signed and witnessed by Johann Pribbernow. Nr. 73. Roggow A, the 14th of October 1877, before the registrar came Friedrich Pribbernow, resident of Meesow, evangelical religion to say that his wife Johanna Pribbernow née Volz, evangelical religion, resident with him in Meesow, gave birth on the 13 Oct 1877 to an un-named son. Signed and witnessed by Friedrich Pribbernow. Note in margin: On the 26th of November 1877, Friedrich Pribbernow came before the registrar to say that his son born on the 13th of October was given the name Albert Gustav Otto Pribbernow. Signed and witnessed by Friedrich Pribbernow on the 26th of November 1877. Nr. 37. Roggow A, the 26th of December 1877, before the registrar came Johann Pribbernow, resident of Meesow, to say that Marie Elise Auguste Pribbernow, 2 years old, evangelical religion, resident of Meesow, born in Meesow, daughter of the witness and his wife Helene née Buss of Meesow, died on 24 Dec 1877. Signed and witnessed by Johann Pribbernow. Nr. ?? Hoffelde, the 5th October 1879, before the registrar came Louise Buss née Pribbernow, resident in Roggow A, evangelical religion to say that Wilhelmine Schellin née Westphal, evangalical religion, resident of Hoffelde, wife of the day-laborer Wilhelm Schellin of Hoffelde on 1 Oct 1879 had a son. Note in margin: In Roggow the 9th of December 1879, the day-laborer Wilhelm Schellin from Hoffelde came to say that the son born the 1st of October was named Wilhelm Hermann Eduard Schellin. After finding the marriage record for my 2x great-uncle in Berlin, I decided to translate all the Kamrath marriage records I could find from Berlin. As far as I can tell, none of these are directly my family, although the chances are that many are extended family (especially those from Kreis Naugard and Regenwalde). I’m putting these here more as a community service so that the text will be searchable on the Internet. The listings are in chronological order. Nr. 183. Berlin, the 13th of Apr 1877, before the registrar came Johann Friedrich Kamrath, evangelical religion, born 25 Oct 1846 in Dahlow, Kreis Saatzig, resident of Berlin, son of the worker David Kamrath of Hansfelde Kreis Saatzig and his wife Johana Luisa née Beikmann resident of Schoenebeck Kreis Saatzig, and Pauline Emilie Auguste Schneider, evangelical religion,born 28 Jun 1849 in Baudenik Kreis Sorau, resident of Berlin, daughter of Johann Gottleib Heinrich Schneider resident of Sorau and his wife Karoline Auguste née Pethig resident of Sagan. Witnessed by ?? Heinrich Leise, resident of Berlin at Freidenstrasse 14 and the bachelor Gerald Schneider, 29 years old, resident of Berlin at Landsbergen Strasse 106. Nr. 967. Berlin the 4th of October 1878, before the registrar came August Ferdinand Lofmann, evangelical religion, born 8 Apr 1850 in Polzow, Kreis Prenzlau, resident of Berlin, son of Johann Karl Christian Lofmann and his wife Marie Louisa née Naggert, resident of Berlin, and Bertha Emilie Johanna Kamrath, evangelical religion, born 3 Feb 1860 in Berlin, resident of Berlin, daughter of Karl Heinrich ?? Kamrath and his wife Dorothea Luisa Emilie née Krüger, residents of Berlin. Witnesses: Friedrich Kluth, resident of Berlin, and the tischlermeister (master cabinet-maker) Friedrich Klinger, resident of Berlin. Nr. 498. Berlin the 14th of October 1879, before the registrar came Johann Gottlieb Friedrich Kamrath, waiter, evangelical religion, born 6 Jul 1850 in Wittenfelde [just outside of Massow], Kreis Naugard, resident of Berlin in Zimmerstrasse Nr. 28, son of the laborer Michael Friedrich Kamrath, resident of Massow, Kreis Naugard, and his wife Friedrike née Lemke, resident of Neuenkirchen, Kreis Naugard, and Mathilde Auguste Schmidt, evangelical religion, born 9 Apr 1858 in Hammersiefau, Kreis Hernberg [Herrenberg? ], resident of Berlin in HombergerStrasse Nr. 30, daughter of Henriette Schmidt, resident of Hommersiefau. Witnesses: Wilhelm Berlin, 49 years old, resident of Berlin, and Heinrich Schorratz, waiter, 23 years old, resident of Berlin. Note: The Kellner Johann Gottlieb Friedrich Kamrath died in Berlin, 7 Jul 1885. Nr. 685. Berlin the 20th of June 1881, before the registrar came Carl Aldomar Oscar Kamrath, evangelical religion, born 28 Apr 1851 in Berlin, resident of Berlin son of Albert Ernst Theodore Kamrath and his wife Johanna Christine Elizabeth née Krumbholz, residents of Berlin, and Dorothee Louise Schulze, evangelical religion, born 28 Aug 1853 in Lietzen, Kreis Lebus, resident of Berlin, daughter of Friedrich Schulze and his wife Anna Kozlin née Schulze, deceased, last resident in Lietzen, Kreis Lebus. Witnesses: Emil Berendt, 32 years old, resident of Berlin, and Paul Klinger, 32 year old, resident of Berlin. Note: Albert Ernst Theodore Kamrath died in Berlin 26 Sept 1896 at the age of 75 (b 1821). Nr. 153. Berlin, the 17th of March 1883, before the registrar came Ferdinand Heinrich Gustav Hoffman, evangelical religion, born 30 Jun 1859 in Prittisch, Kreis Birnbaum (Posen, Prussia), resident of Berlin, son of Ludwig Hoffmann and his wife Wilhelmine née Karg, residents of Prittisch, and Anna Louise Caroline Kamrath, born 10 Dec 1860 in Stargard, Pommern, daughter of the worker Johann Kamrath and his wife Friedrike Caroline née Bermin residents of Stargard in Pommern. Witnesses: August Buschmann, 25 years old, resident of Berlin, and Robert Zieno, 32 years old, resident of Berlin. No. 622, Berlin, the 10th of October 1884, before the registrar came the “Portier” (doorman) Otto Hermann Julius Kamrath, evangelical religion, identified by the marriage banns register, born the 9th of July 1859 in Hoffelde, Kreis Regenwalde, resident of Berlin, Steglitzer Straße No. 5 and 6, son of the “Stellmacher” Carl Kamrath, who emigrated to America and is currently residing in state of Wisconsin, and his deceased wife Henriette née Pribbernow from his first marriage, last resident in Hoffelde, and Helene Zielinski, “früher in Diensten” – previous to be in service, identified in the same way, the fiancé did, catholic religion, born in November, 9th, 1863 in Barlewitz, Kreis Stuhm, WestPreussen (Barlewice, Sztum, Poland today), resident of Berlin, Steglitzer Straße No. 5 and 6, daughter of the “Eigenthümer” (farm-owner) Johann Zielinski, who died in Christburg, (Kreis Stuhm) Westpreussen, and his wife Helene née Ehlert residents of Baumgarth in Kreis Stuhm. Witnesses: The “Schneidermeister” (master tailor) Johann Kunde, identified by his “military pass” , 35 years old, resident of Berlin, Genthiner Straße Nr. 39 (Berlin-Tiergarten) , “Tischler” (cabinet-maker) Ferdinand Wurmmehl, 32 years old, identified also by his military pass, resident of Berlin, Schwerinstraße Nr. 6. Nr. 929. Berlin the 20th November 1884, before the registrar came the laborer Albert Friedrich Julius Kamrath, evangelical religion, born 11 Dec 1859 in Schönwalde, Kreis Naugard, resident of Berlin, son of Ernst Kamrath and his wife Auguste Wilhelmine Kamrath née Vergin, residents of Freienwalde (Kreis Stargard) in Pommern (Pomerania) and Berta Friederike Auguste Schultz, evangelical religion, born 2 Jun 1860 in Freienwalde in Pommern, resident in Berlin, daughter of the deceased carpenter Carl Friedrich Auguste Schulz from Freienwalde and his wife Rosaline Henriette Emelie née Müller deceased. Witnesses: August Lemke, 33 years old, resident of Berlin at Müllerstrasse Nr. 40a, and Wilhelm Heinrich Krierke, 39 years old, resident of Berlin. Note: Margin note that the groom died in 1937 (record 873), and another that the bride died in 1934 (record 18). Nr. 568. Berlin the 6th of June 1887, before the registrar came Albert August Richard Otto, identified by his birth certificate, born 25 Oct 1862 in Berlin, resident of Berlin, son of Albert Otto from Berlin and his wife the deceased Emelie Luisa née Gross last resident in Berlin, and Agnes Helene Pauline Kamrath, evangelical religion, born 21 Oct 1866 in Berlin, resident of Berlin, daughter of the tischlermeister (master furniture-maker) Carl Heinrich Franz Kamrath and his wife Johanna Dorothea Luisa Emilie née Krüger, residents of Berlin. Witnesses: August Lofmann, 34 years old, resident of Berlin, and Albert Otto, 59 years old, resident of Berlin. Nr. 139. Berlin the 27th of March 1888, before the registrar came the Fabrikarbeiter (cloth-worker?) Carl Gustav Erdmann, evangelical religion, born 27 Feb 1855 in Preussich-Holland, resident of Berlin at Müllerstrasse Nr. 12, son of Amelie Erdmann Wiezorreck, resident of Berlin, and Marie Auguste Johanne Kamrath, evangelical religion, born 5 Jan 1857 in Massow, Kreis Naugard, resident of Berlin at Bülowstrasse Nr. 20a, daughter of Johann Michael Friedrich Kamrath and his wife Caroline Wilhelmine Augustine née Hansel, residents of Colberg Kreis ??. Witnesses: The tischler (furniture-maker) Otto Friemann, aged 19, resident of Berlin at Garlandstrasse Nr. 39, and Friedrich Reiher, aged 34, resident of Berlin Bülowstrasse Nr. 20. Nr. 172. Berlin the 27th April, 1888, before the registrar came Johann Wilhelm Tiedemann, evangelical religion, born 3 Dec 1850 in Eversdorf, Kreis Salzwedel, resident of ? ?, son of Heinrich Tiedemann and his wife ?? née Wichmann resident of Salzwedel and Eversdorf, and Auguste Wilhelmine Friedricke Kamrath, evangelical religion, born 2 Jun 1859 in Massow (Kreis Naugard), resident of Charlottesburg? daughter of the workman August Kamrath from Massow, and his wife ?? née Krupke resident in Massow. Witnesses: Albert Wrasse, 22 years old, resident of Marlot?, and Christian Saur, resident of Berlin. Nr. 1098. Berlin the 2nd November 1889, before the registrar came the “Schlosser” (locksmith) Carl Hermann Julius “Hermann” Kamrath, identified by his “Taufschein” – baptismal certificate, evangelical religion, born 30 Jul 1837 in Massow, Kreis Naugard, resident of Berlin Boyenstraße 10 (in Central Berlin), son of the Schneidermeister – master tailor Christian Friedrich Kamrath and his wife Anna Sophia neé Buths, ( Butz), both deceased, last resident in Massow, and Louise Marie Wilhelmine Lüneberg, born 23 Dec 1841 in Neustettin Kreis Neustettin, resident of Berlin, Boyenstrasse 10, daughter of the “Schlossermeister” (master locksmith) Friedrich Wilhelm Lüneberg and his wife Caroline Friedrike Emilie née Dumke, both deceased, last resident in Bromberg. Witnesses: Anna Griebe née Schnee, 30 years old, resident of Berlin, Ackerstrasse Nr 85 (Central Berlin), and the “Korbmacher” (basket maker) Ernst Steinig, 33 years old, resident of Berlin, Ackerstrasse Nr 87. A note in the sidebar indicates a divorce: Berlin 23 May 1892, The Royal County Court Nr. 1 has legally announced on 2 May 1892, that the marriage between the “Schlosser” Karl Hermann Julius Kamrath and Louise Maria Wilhelmine Kamrath née Luneburg has been dissolved. The registrar Witt. Note: A previous wife Emilie Friederike Luedtke died in Berlin on 31 Jul 1886 at the age of 43 (b 1843). Note: Hermann Kamrath died 27 Jun 1913 in Berlin. Nr. 27. Berlin the 12th January 1891, before the registrar came Johann August Pardau, evangelical religion, born 20 Feb 1868 in Laaske, Keis Westprignitz (Brandenburg), resident of Berlin, son of ?? Pardeau .. workman Stier, resident in Laaske, and Anna Emilie Friederike Kamrath, evangelical religion, born 2 Dec 1869 in Klein Kniephof, Kreis Naugard, resident of Berlin, daughter of the laborer Julius Wilhelm Hermann Kamrath and his wife Henriette Sophia Wilhelmine née Retzlaff residents of Karolinenhöhe, Kreis Naugard (Dobra, Poland today, about 5 miles from Meesow). Witness: Julius Mltzow, 58 years old, resident of Berlin, and Güstave Reinhold Seyforth, 27 years old, resident of Berlin. Nr. 842. Berlin the 24th October 1891, before the registrar came Luis Phillip Waldemar Kamrath, evangelical religion, born 8 Jun 1867 in Berlin, resident of Berlin, son of Albert Ernst Theodor Kamrath and his wife Johanne Christine Elisabeth née Krumbholtz, resident in Berlin, and Emma Auguste Frehland, evangelical religion, born 25 Jul 1866 in Friedrichsberg, Kreis Niederbarnim, resident in Berlin, daughter of the carpenter Carl Friedrich Rudolf Frehland and his wife Luise Friedrike Auguste née Kuehne, resident in Berlin. Witnesses: Otto Haeffner, 30 years old, resident of Berlin, and Emil Berendt, 35 years old, resident of Berlin. Nr. 989. Berlin, the 12 Oct 1892, before the registrar came Karl (Carl) Hermann Julius “Hermann” Kamrath, Schlosser (locksmith), identified by his birth certificate, evangelical religion, born 30 Jul 1837 in Massow, Kreis Naugard, resident in Berlin at Oppelnerstraße 31, son of the Schneidermeister (master tailor) Christian Friedrich Kamrath, and his wife Anne Sofia née Buths (Butz) who died in Berlin, formerly resident in Massow, and the widow and kürschner (furrier) Johanne Pauline Maria Budschewski née Watchke, näherin (needleworker), identified by her birth certificate, born 24 Aug 1853 in Grätz, Kreis Lissa (Posen, Prussia), resident of Berlin at Lange Straße 27, daughter of the Schmeidemeister (master blacksmith) August Watschke, deceased, last resident in Storchnest, Kreis Lissa (Posen, Prussia) and his wife Dorothea née Dittmann resident of Berlin. Witnesses: Otto Schnabel, resident of Berlin Lange Straße 27, and ? Zelke, resident of Berlin, Grünner Strasse 92. Note: Sophie Kamrath née Butz widow of the Schneidermeister (master tailor) Christian Friedrich Kamrath died on 31 Dec 1872 in Massow of old age (Altersschwäche) aged 77 years, 1 month (b Nov 1795). Burial on 4 Jan 1873. She leaves 2 sons and 3 daughters. Note: Nr. 28. Berlin the 4th January 1903. Johanna Pauline Marie Kamrath née Watchke, died 3 Jan 1903 aged 49 years of a cervical tumor (Gebärmuttergeschwulst), married for 10 years. Nr. 13. Nieder Schönhausen, the 11th June 1893, before the registrar came Johann Friedrich Carl Otto Kürbitz, evangelical religion, born 25 Nov 1867 in Neider Schönhausen, resident of Neider Schönhausen, son of Friedrich Kürbitz and his wife ?? née Zander, residents of Nieder Schönhausen, and Ida Elise Anna Kamrath, evangelical religion, born 25 Feb 1872 in Klein Kneiphof, Kreis Naugard, resident of Nieder Schönhausen, daughter of the laborer Julius Wilhelm Hermann Kamrath and his wife Henriette Sophia Wilhelmine née Retzlaff, residents of Daber Freiheit, Kreis Naugard. Witnesses: Rudolf Hempel, resident of Nieder-Schönhausen, and the laborer Wilhelm Linke, resident of Nieder-Schönhausen. Nr. 38. Berlin the 2nd February 1895, before the registrar came Otto Ernst Adolf Lorenz, evangelical religion, b 19 Sept 1871 in Lÿchen, Kreis Templin, resident of Brederiche, Kreis Templin, son of Friedrich Lorenz and his wife Caroline née Eggert, residents of Bredereiche, and Friederike Pauline Auguste Kamrath, evangelical religion, b 12 Jul 1870 in Berlin, resident in Berlin, daughter of the schlosser (locksmith) Carl Hermann Julius Kamrath and his wife Friederike Emilie née Lüdicke, deceased, resident in Berlin. Witnesses: Wilhelm Dräger, resident of Berlin, and the Schlosser Hermann Kamrath, 57 years old (b 1837), resident in Berlin. Nr. 119. Berlin the 11th of March 1895, before the registrar came Hermann Emil Harz, evangelical religion, born 3 Oct 1869 in Herzberg, Kreis Schweinitz, resident of Berlin at Krindorffstrasse 250, son of widow Harz Ligne née Franke, resident in Herzberg, and Mathilde Auguste Kamrath née Schmidt, born 9 Apr 1854 in Hammersviesen, Kreis Sternberg, resident of Berlin Krindorffstrasse 250, daughter of Heneritte Schmidt, resident of Berlin. Witnesses: the worker Gottlieb Albrecht, 47 years old, resident of Bixdorf, Kreis Fetter, Herfurth Strasse 33, and ?? Wollbert , 42 years old, resident of Berlin. There is also a note on the margin dated 31 Jan 1900. Nr. 308. Berlin the 17th April 1896, before the registrar came Luis Philipp Waldemar Kamrath, evangelical religion, born 8 Jun 1867 in Berlin, resident of Berlin, son of Albert Ernst Theodor Kamrath and his wife Johanne Christiane Elisabeth née Krumbholz, resident in Berlin, and Hedwig Pauline Luise Schwarten, evangelical religion, born 26 Jul 1869 in Berlin, resident of Berlin, daughter of the carpenter Joachim Heinrich Schwarsen and his wife Bertha Friederike Wilhelmine née Tolzmann, resident in Berlin. Witnesses: Otto Haffner, 39 years old, resident of Berlin, and Emil Kamrath, 33 years old, resident of Berlin. Nr. 874. Berlin the 10th October 1896, before the registrar came Martin Gustav August Lamprecht, identified by his birth certificate, evangelical religion, born 23 Feb 1870 in Berlin, resident of Berlin, son of Louis Karl Lamprecht and his wife Helene Charlotte Friedrike Dorothea née Düsscke, resident in Berlin, and Emilie Marie Anna Kamrath, evangelical religion, born 8 Nov 1867 in Biesenthal, Kries Oberbarnim [just north of Berlin], resident in Berlin, daughter of Friedrich Wilhelm Kamrath who died in Berlin and his wife Emelie Gruniella Albertine née Zanke, resident of Berlin. Witnesses: The merchant (kaufmann) Otto Klatt 34 years old, resident of Berlin, and Hermann Kamrath, 54 years old (b 1842), resident of Berlin at Hochstrasse 39. Note on the margin that the husband (ehemann) died 19 Mar 1942. Nr. 1027. Berlin the 19th of November 1896, before the registrar came the laborer Ernst August Wilhelm Schmidt, evangelical religion, born 6 Nov 1873 in Damsdorf, Kreis Striegau, resident of Berlin at Ostbahnhof Strasse 6, son of the laborer Johann Carl August Schmidt and his wife Anna Rosina Henster, resident of Hartwigswaldau, Kreis Teuer, and Amanda Amalie Emilie Kamrath, evangelical religion, born 6 Mar 1874 in Herzfelde, Kreis Niederbarnim, resident of Berlin at Gruenerweg Strasse 7, daughter of the Schlosser (locksmith) Hermann Kamrath, resident in Berlin, and his wife Friederike Emilie née Lüdicke born in and current resident of Berlin. Witnesses: The locksmith Hermann Kamrath, 59 years old (b 1837) resident of Berlin at Grünerweg 57, and Gustav Schnabel, 32 years old, resident of Berlin at Lange Strasse 26. Note in the margin that Amanda Amalie Emilie Kamrath died 17 Sept 1939, record 1608 in Berlin. Nr. 550. Berlin the 20th October 1897, before the registrar came Hans Eduard Friedrich Wilhelm Kamrath, evangelical religion, born 28 May 1862 in Berlin, resident of Berlin, son of Wilhelm Kamrath and his wife Johanna Dorothea née Luddecke, deceased, residents of Berlin, and Johanne Henriette Wilhelmine Stellman, evangelical religion, born 5 Sept 1868 in Berlin, resident of Schöneberg, daughter of Louis Johann Moritz Stellmann and his wife Johanna Wilhelmine née Lambrect, resident of Schöneberg. Witnesses: Emil Stellmann, 30 years old, resident of ? ?, Louis Stellmann, 58 years old, resident of Schöneberg. Nr. 556. Berlin the 23rd May 1900, before the registrar came the laborer Ludwig Martin Carl Kamrath, evangelical religion, born 25 Aug 1866 in Damerow, Kreis Naugard, resident in Berlin, son of the worker August Kamrath resident of Naugard, Kreis Naugard, and his wife Louisa Augusta Wilhelmine née Haegler resident in Nauguard, and Maria Radzio, evangelical religion, born 29 Sept 1874 in Saÿden, Kreis Retzko, resident in Berlin, daughter of the Stellmacher Fritz Radzi0o and his wife Else née Warschewitz, residents of Saÿden. Witnesses: Emil Dräger, 38 years old, resident of Berlin, Friedrich Achenback, 32 years old, resident of Berlin. Notation that a son Wilhelm was born in Berlin, Record Nr. 628 of 1908, and he was married record number 224 in 1940. Nr. 346. Schöneberg the 25th of May 1901, before the registrar came Carl Ferdinand August Kamrath, evangelical religion, born 8 Oct 1874 in Klein Zapplin, Kreis Griefenberg, resident in Schöneberg, son of August Kamrath and his wife Wilhelmine née Brandt resident in Podejuch, Kreis Randow (just southeast of Stettin), and Caroline Wilhelmine Miethke né Groger, evangelical religion, born 30 Mar 1863 in Pretschen, Kreis Lübben, resident of Schöneberg, daughter of the miller Friedrich Groger andhis wife Johanna née Schwatke, residents of Pretschen. Witnesses: The laborer Wilhelm Posen, 33 years old, resident of Schöneberg, and Hugo Giefsmann, 25 years old, resident of Schöneberg. Nr. 902. Berlin the 2nd of October 1901, before the registrar came Carl Hermann Gustav Kamrath, identified by his birth certificate, evangelical religion, born 21 Mar 1876 in Schöpsfurth, Kreis Oberarnim, resident of Berlin at Gollnowstrasse 29, son of Hermann Kamrath of Berlin and his deceased wife Emilie née Lüdke last resident in Berlin, and Therese Clara Frida Müller, identified by her birth certificate, evangelical religion, born 21 Mar 1876 in Neubrück ,Kreis Neiderbarnim, resident of Berlin, daughter of Wilhelm Müller resident in Neubrück and his wife Dorothea Sofia Tietz née Boddin resident in Berlin. Witnesses: the Kellner (merchant) August Kohlhase, 28 years old, resident in Berlin, and Emil Knychalla, 40 years old, resident in Berlin. Nr. 959. Berlin the 5th of October 1901, before the registrar came Albert Max Waldemar Kamrath, identified by his birth certificate, evangelical religion, born 1 Jun 1878 in Schönfurth, Kreis Oberbarnim, resident of Berlin, son of the schlosser (locksmith) Hermann Kamrath resident in Berlin, and his deceased wife Emilie née Lüdkt, last resident in Berlin, and Anna Wilhelmine Reinbacher, identified by her birth record, evangelical religion, born 28 Jun 1879 in Berlin, resident of Berlin, daughter of Christian Reinbacher and his wife Anna née Fost, resident in Berlin. Witnesses: the Schlosser Hermann Kamrath, 64 years old, resident of Berlin, and Christian Reinbacher, 49 years old, resident of Berlin. Note in margin indicates that Albert Max Waldemar Kamrath died 28 Jan 1961 in Berlin, record 360 in 1961. Note in margin indicates a daughter Erna Hanna born record 1085 in 1915 in Berlin. Died 28 Jun 1941, Nr. 1854. Nr. 1037. Berlin the 12th October 1901, before the registrar came Wilhelm Hermann Otto Hengst, identified by his birth certificate, evangelical religion, born 3 Oct 1874 in Tangermünde, Kreis Stendal, resident in Berlin at Prinzen Strasse 78, son of Wilhelm Hengst, resident of Tangermünde, and his wife Anna Emilie née Heinze, resident in Tangermünde, and Clara Martha Gertrud Kamrath, identified by her christening record, evangelical religion, born 29 May 1874 in Biesenthal, Kreis Ober Barnim, resident in Berlin at Hoch Strasse 44, daughter of Friedrich Wilhelm Kamrath and his wife Emilie Henriette Albertine née Fanke, resident in Berlin. Witnesses: The Kaufmann (businessman) Otto Klatt, 42 years old, resident of Berlin, and the wagonmeister Hermann Kamrath, 57 years old (b 1834), resident of Berlin at Hoch Strasse 39. Nr. 328. Berlin the 11th April 1902, before the registrar came the musiklehrer (music teacher) Hermann Karl Otto Kamrath, evangelical religion, born 19 Feb 1872 in Stettin, resident in Berlin Luisan Ufer, son of Karl Johann Andreas Kamrath and his wife Hulda Caroline Albertine née Slater?, resident in Stettin, and Else Helene Elise Wagner, evangelical religion, born 15 May 1882 in Rixdorf, resident of Berlin, daughter of Karl Albert Gottlieb Wagner and his wife Elvira Albertine Ernestine née Salmon, resident in Berlin. Witnesses: Karl Kamrath, 65 years old (b 1837) resident of Stettin, and Max Kamrath, 33 years old (b 1869), resident of Swinemunde. Nr. 480. Charlottenburg the 27th of September, 1902, before the registrar came the laborer Carl Freidrich Fuchs, evangelical religion, born 12 Apr 1872 in Charlottenburg, son of the laborer Gottlieb Fuchs from Charlottenburg, and his wife Luise née Rvowatznu, deceased, resident of Mohrungen, and Auguste Marie Caroline Kamrath, evangelical religion, b 15 Oct 1872 in Massow, Kreis Naugard, resident in Charlottenburg, daughter of the laborer Karl Friedrich August Kamrath and his wife Johanna Auguste Wilhelmine née Timm, resident in Massow. Witnesses: Jonerty Michalski, 30 years old, resident of Charlottenburg, and August Riemann, 43 years old, resident of Charlottenburg. Note of a daughter born in Charlottenburg, record 939 in 1904. Another record noted Nr. 409, 1939. Nr. 153. Berlin the 4th of April 1903, before the registrar came Albert Friedrich Wilhelm Kamrath, evangelical religion, born 14 Feb 1879 in Jarchlin, Kreis Naugard, resident of Berlin, son of the schneidemeister Heinrich Kamrath from Jarchlin and his deceased wife Constine née Hoefs, last resident in Jarchlin, and Anna Klara Paul, evangelical religion, born 1 Jun 1879 in Linderode, Kreis Torau, resident in Berlin, daughter of the worker Karl Paul resident of Zugkleibe and his wife Johanna Christine née Hansch, resident in Zugkleibe. Witnesses: the worker Julius Hartmann, 34 years old, resident of Berlin, and the worker Julius Ruezewski, 30 years old, resident of Berlin. Nr. 410. Berlin the 27th of April 1904, before the registrar came the laborer Karl Friedrich August Miethert, identified by his birth certificate, evangelical religion, born 29 Mar 1875 in Sellin, Kreis Königsburg in Neumark, resident in Berlin at Lübarkovstrasse 45, son of August Miethert and his wife Karoline née Schmidt, both deceased, last resident in Sellin, and Anna Friederike Ernestine Kamrath, evangelical religion, born 26 Jul 1877 in Borkenhagen, Kreis Naugard (just northeast of Roggow A), resident in Berlin at Alt-Morbil 99, daughter of the laborer Ferdinand Kamrath of Stargard and his wife Friedrike née Paulsch, resident in Stargard. Witnesses: The laborer Ferdinand Kamrath, 53 years old (b 1851), resident of Stargard, and Robert Grail, 34 years old, resident of Berlin at Lübarkovstrasse 2. Nr. 589. Berlin the 14th of May 1904, before the registrar came the laborer Hermann Wilhelm Ernst Bartelt, evangelical religion, born 17 Feb 1879 in Kempen-Uchtenhagen, Kreis Saatzig, resident in Berlin, son of the deceased laborer Friedrich Bartelt, last resident in Kempen-Uchtenhagen and his wife Marie Helene née Klensky, resident in Stargard, Pommern, and Berta Auguste Kamrath, evangelical religion, born 5 Sept 1877 in Massow, Kreis Naugard, resident in Berlin, daughter of the worker August Karl Friedrich Kamrath and his wife Johanna Auguste Emilie née Timm, residents of Massow. Witnesses: the laborer Franz Bertelt, 31 years old, resident of Berlin, the laborer Gustave Vandersee, 38 years old, resident of Berlin. Nr. 474. Schöneberg the 16th of May 1904, before the registrar came Paul Robert Bierwagen, catholic religion, born 19 Oct 1881 in Leimnitz, Kreis Zullichan, Schweisus, resident in Schöneberg, son of Robert Bierwagen and his wife Mauen née Klemmt, resident in Jordan Kreis Zullichan Schweisus, and Anna Auguste Maria Kamrath, evangelical religion, born 28 Aug 1878 in Daber, Kreis Naugard, resident in Schöneberg, daughter of the schneider August Kamrath and his wife Wilhelmine née Schwede, resident in Daber. Witnesses: Florin Harth, 26 years old, resident of Jordan, Hermann Richter, 54 years old, resident of Charlottenburg. Note in margin that a son was born Nr. 697 in 1904, Berlin. Note in margin that the groom(?) died Nr. 1473 in 1939. Nr. 1233. Berlin the 18th of October 1904, before the registrar came Richard Gottlieb Lebrecht Eickermann, identified by his birth certificate, born 12 Jan 1853 in Berlin, resident in Berlin, son of Hans Hermann Christoph Eickermann and his wife Friedrike Wilhelmine née Bauerfeind, resident in Berlin, and Albertine Auguste Luise Kamrath, evangelical religion, born 18 Apr 1862 in Greybordsone, Kreis Regenwalde, resident in Berlin, daughter of Wilhelm Kamrath, Karnitz, Kreis Regenwalde and his wife Friedrike Guse, resident in Berlin. Witnesses: Albert Nürnberg, 57 years old, resident of Berlin, and Richard Busch, 39 years old, resident of Berlin. Nr. 421. Berlin the 17th of April 1905, before the registrar came the schlosser (locksmith) Johannes Georg Kamrath, evangelical religion, born 30 Jan 1882 in Berlin, resident of Berlin, son of the kellner Johann Gottlieb Friedrich Kamrath resident in Berlin, and his wife Mathilde Auguste née Schmidt, resident in Berlin, and Luise Emilie Karoline Jeschke, evangelical religion, born 28 Jan 1883 in Grabow, Kreis Königsberg-Neumark, resident in Berlin, daughter of Johann Karl Heinrich Jeschke and his wife Wilhelmine Emilie née Busch, resident in Berlin. Witnesses: Karl Schütze, age 44, resident of Berlin at Loffner Strasse 13 and Otto Schramlöhmer, 27 years old, resident of Berlin at Kürgnuicker Strasse 115. Nr. 725. Berlin the 5th of August 1905, before the registrar came Erich Hugo Ernst Kamrath, evangelical religion, born 24 May 1883 in Berlin, resident of Berlin, son of the schlosser Karl Herman Julius Kamrath resident in Berlin and his deceased wife Friedricke Emilie née Lüdke, last resident in Berlin, and Emma Auguste Ida Rink, evangelical religion, born 29 Jul 1883 in Berlin, resident in Berlin, daughter o fKarl Julius Gustav Rink, resident in Berlin, and his wife Maria née Worlitzer, resident in Berlin. Witnesses: Anna Kamrath, 26 years old, resident of Berlin, and the schlosser Hermann Kamrath, 68 years old (b 1837), resident of Berlin. Nr. 187. Pankow the 28th of September 1907, before the registrar came Hermann Otto Paul Kamrath, identified by his birth record, evangelical religion, born 25 Jul 1881 in Stettin, Resident in Pankow at Wilhelmstrasse 52, son of the laborer August Friedrich Wilhelm Kamrath and his wife Henriette Charlotte Carolina née Kammer, deceased, last resident in Stettin, and Ida Emma Reigber, evangelical religion, born 30 Sept 1881 in Malschwitz, Kreis Freistadt, resident in Pankow, daughter of Edouard Reigber resident in Neusalz on the Oder, and his wife Auguste née Weigelt, resident in Pankow. Witnesses: Otto Kamrath, age 30, resident in Stettin, Lallanum Strasse 47, and Gustav Pochadt, age 25, resident in Stettin. Note in margin that the couple were divorced in Pankow 14 Mar 1909. Nr. 712. Berlin the 5th of August 1907, before the registrar came the kaufmann Emil Paul Weidlich, evangelical religion, born 12 Nov 1877 in Breslan, resident of Berlin, son of Emilie Weidlich resident in Berlin, and Margarete Franziska Martha Kamrath, evangelical religion, born 26 Oct 1880 in Eberswalde, Kreis Oberbarnim, resident in Berlin, daughter of Hermann Julius Kamrath, resident in Berlin and his wife Emilie née Lüdke, deceased, last resident in Berlin. Witnesses: the kaufmann Adolf Lilbermann, 49 years old, resident of Berlin, and Paul Uthleb, 39 years old, resident of Berlin. Nr. 748. Berlin the 24th of July 1909, before the registrar came Emil Ernst Hagen, identified by his birth record, evangelical religion, born 3 Jul 1884 in Tütz, Kreis Deutsch-Krone, resident of Berlin, son of Johann Hagen and his wife Mathilde née Pidde, resident in Gramswalde, Kreis Deutsch-Krone, and Olga Berta Ottilie Kamrath, identified by her birth record, evangelical religion, born 19 Dec 1887 in Plathe, Kreis Regenwalde, resident in Charlottenburg, daughter of August Kamrath and his wife Wilhelmine Knaack, residents of Greifenberg. Witnesses: Hermann Rast, 27 years old, resident of Berlin, and the kaufmann Emil Kamrath, 38 years old, resident in Oranienburg. Note in margin that the bride died in Berlin – Lichtenrade on 23 Dec 1961, record 2464 in 1962. Nr. 689. Berlin the 27 October 1909, before the registrar came Hermann Otto Paul Kamrath, identified by his birth record, evangelical religion, born 25 Jul 1881 in Stettin, resident of Berlin, son of the laborer August Friedrich Wilhelm Kamrath and his wife Charlotte Karoline née Kammer, deceased, last resident in Stettin, and Martha Maria Hirschberg, identified by her birth record, catholic religion, born 31 Jan 1885 in Königsberg in Preussen, resident of Berlin, daughter of Johan Hirschberg and his wife Katharine née Lang, resident in Berlin. Witnesses: the laborer Joseph Hirschberg, 50 years old, resident of Berlin, and Robert Karger, age 52, resident of Berlin. Note in margin regarding record from 12 Sept 1928. Perhaps a divorce? Note: Daughter Margarete Elsbeth Martha Kamrath, born 1910 died 31 Mar 1914 in Berlin – Wilmersdorf. Nr. 829. Berlin the 24th of December 1909, before the registrar came Karl Johann Friedrich Kamrath, identified by his birth record, evangelical religion, born 19 Aug 1887 in Neddesitz, Kreis Rügen, resident of Berlin, son of the laborer Karoline Juliana Johanna Hinz née Kamrath, resident in Neddesits, and Klara Pauline Marie Jurk, identified by her birth record, evangelical religion, born 7 May 1891 in Berlin, resident in Berlin, daughter of the laborer August Wilhelm Jurk and his wife Johanna Elizabeth Pauline née Rau, both resident in Berlin. Witnesses: the laborer August Jurk, 56 years old, resident of Berlin, and the tailor Gustav Pantow, age 32, resident of Berlin. Note in margin that couple divorced or had marriage annulled in Berlin on 8 Oct 1925. Nr. 28, Reinickendorf, the 5th of March 1910, before the registrar came Willi Waldemar Erich Kröcher, evangelical religion, born 18 Apr 1885 in Manker Kreis Ruspin, resident in Berlin, son of Hermann Kröcher deceased, and his wife Sophia née Rorsvedt resident of Berlin, and Frieda Elvira Gertrud Kamrath, evangelical religion, born 28 Oct 1884 in Berlin, resident of Reinickendorf, daughter of Albert Friedrich Julius Kamrath, and his wife Berta Friedricke Auguste née Schultz, resident in Reinickendorf. Witnesses: Julius Kamrath, 50 years old, resident of Reinickendorf, and Alfred Kröcher, 28 years old, resident of Siemensstadt. Nr. 445, Berlin the 14th of April 1910, before the registrar came Friedrich Hermann Wilhelm Kamrath, identified by his birth record, evangelical religion, born 5 Apr 1885 in Berlin, resident in Berlin at Ufertstrasse 14a, son of Adolf Hermann Wilhelm Kamrath and his wife Friedricke Wilhelmine Maria née Galze, resident in Berlin, and Rosa Emma Luise Meÿer, identified by her birth record, evangelical religion, born 27 Nov 1885 in Berlin, resident in Berlin at Endmanstrasse 40, daughter of the worker Lang, and Friederike Dorothea Sophia née Meÿer, resident in Berlin. Witnesses: Hermann Kamrath, age 66 (b 1844), resident of Berlin at Uferstrasse 14a, and Karl Meÿer, 41 years old, resident of Berlin at Endmanstrasse 40. Nr. 1039. Berlin the 15th of November 1913, before the registrar came Oscar Julius Franz Kamrath, identified by his birth record, evangelical religion, born 6 Apr 1886 in Berlin, resident in Berlin, son of the laborer Johann Friedrich Kamrath and Pauline Emilie Agnes née Schneider, both resident in Berlin – Wissensee, and Marie Agnes Luise Schmidt, evangelical religion, born 6 Dec 1887 in Berlin, resident in Berlin, daughter of Gustave Julius Wilhelm Schmidt, deceased, formerly resident in Berlin, and his wife Marie Helene ?? née Mucherpfennig, resident in Berlin. Witnesses: Adolf Silbermann, 55 years old, resident of Berlin, and Paul Weidlich, 35 years old, resident in Berlin. Note in margin that the bride died in Berlin on 30 Apr 1957. Record 82 in 1957. Note in margin that the couple had a son born 14 Mar 1915 in Berlin, record 387 in 1915. Married 22 Nov 1941, record 67 in Hohen-Neuendorf. Nr. 792. Charlottenburg the 15th of November 1913, before the registrar came the fabrikarbeiter (factory worker) Rudolf Otto Waldemar Kamrath, evangelical religion, born 4 Oct 1889 in Berlin, resident of Charlottenburg Krumman Strasse 48, son of Fernard Louis Philipp Waldemar Kamrath resident in Charlottenburg, and his deceased wife Anna Auguste née Frehland last resident in Berlin, and Luise Anna Margarete Minetzke, evangelical religion, born 7 Feb 1894 in Charlottenburg, resident in Charlottenburg, daughter of the laborer Johann Georg Robert Minetzke, resident in Bahrenbruch, Kreis Naugard, and his wife Marie Franziska Hanna née Waurich, resident in Charlottenburg. Witnesses: the laborer Arthur Ohst, 23 years old, resident in Charlottenburg, and the worker Franz Warnik, 28 years old, resident in Charlottenburg. Nr. 204. Berlin – Steglitz the 20th of May 1914, before the registrar came the kalkulator Paul Julius Theodor Boeder, evangelical religion, born 24 Apr 1866 in Stargard, Pommern, resident in Berlin – Steglitz at Althoffstrasse 3, son of Friedrich Wilhelm Boeder and his wife Emma Therese née Pushbelde, resident in Berlin – Steglits Eliseustrasse 25, and Else Frieda Luise Kamrath, identified by her birth record, evangelical religion, born 14 Nov 1880 in Danzig, resident in Danzig Rennerstiftsrasse 1, daughter of the kempfmann Johann Hermann Kamrath and his wife Christine Marie Luise née Mittrich, both deceased, last resident in Danzig. Witnesses: Julius Unger, age 44, resident of Berlin – Steglitz at Heinstrasse 8, and the kaufmann Roland Kamrath, age 23, resident of Charlottenburg at Augsburger Strasse 38. Nr. 122, Berlin the 22nd of March 1917, before the registrar came Wladislaus Johann Leon Matuszczak, ?? religion, born 19 Apr 1890 in Berlin, resident of Berlin, son of Stephan Matuszczak and his wife Sophia née Teska, resident of Berlin, and Emma Luise Pauline Kamrath, evangelical religion, born 18 Aug 1885 in Danzig, resident of Berlin, son of Johann Hermann Kamrath and his wife Maria Luisa née Mittrich, deceased, formerly resident in Danzig, resident in Danzig – Langführ. Witnesses: Helmut Kamrath, age 29, resident of Charlottenburg – Berlin, and Stephan Matuszczack, age 63, resident of Berlin. Note in margin: Berlin 2 Jun 1934, perhaps a divorce? Nr. 225. Neukölln the 19th July 1917, before the registrar came the kaufmann Ferdinand Georg Bruno Kamrath, evangelical religion, born 14 Feb 1892 in Berlin, resident in Neukölln, son of Luisa Friek and Olaf Panzer resident in Berlin, Heinrich Adolf Wilhelm Kamrath resident in Berlin and his deceased wife Johanna Fridrike Marie née Helmke resident in Neukölln, and Charlotte Marie Elsa Herger, evangelical religion, born 25 Aug 1894 in Camburg, Kreis Saalfeld, resident in Neukölln, daughter of Gustav Hermann Herger resident in Camburg and his deceased wife Hanna nee Nachsigall, last resident in Camburg. Witnesses: Lamford Fuetterer, 40 years old, resident in Neukölln, Frieda Schulze née Teuert, 28 years old, resident in Neukölln. 29th of October 1917, before the registrar came the landwirt (farmer) Walter Kamrath, identified by his birth record, evangelical religion, born 20 Feb 1889 in Falkenberg, Kreis Naugard, resident in Berlin – Wilmersdorf, son of Wilhelm Kamrath and his wife Anna née Spiegel, both deceased, last resident in Falkenberg, and Erna Gertrude Preuss, identified by her birth record, evangelical religion, born 31 Oct 1890 in Königsberg in Preussen, resident in Berlin – Wilmersdorf, daughter of Lois Konstantin Ernst Preuss and his wife Johanna Anna née Werner, resident in Berlin-Wilmersdorf. Witnesses: Martha Preuss, age 49 years, resident in Berlin-Wilmersdorf, Margarete Grüneberg, identified by her confirmation document, 24 years old, resident in Strausberg near Berlin. Nr. 121, Berlin – Schöneberg the 28th of March 1918, before the registrar came the Schlosser (locksmith) Karl Ferdinand August Kamrath, evangelical religion, born 7 Oct 1874 in Klein Zappelin Kreis Griefenberg, resident in Berlin – Schöneberg, son of the deceased Landwirth August Kamrath, last resident in Timmel, Kreis Aurich, and his wife Wilhelmine née Brandt resident in Timmel, and Emma Emilie Bertha Thiel, evangelical religion, born 18 Jan 1886 in Johnsdorf Kreiss Sprottau, resident in Berlin – Schöneberg, daughter of the laborer Karol Gustave Theil and his wife Emilie Louise née Kuners, residents of Sprottau. Witnesses: Murther Werner, 33 years old, resident in Berlin – Schöneberg, Franz Mikolarshek, 48 years old, resident in Magdeburg Cracau. Nr. 72, Berlin – Reinickendorf the 15th of May 1918, before the registrar came Wilhelm Albert Johannes Kobsch, evangelical religion, born 28 Apr 1888 in Pölitz, Kreis Randow, resident in Berlin, son of Albert Kobsch and his wife Auguste née Ebelt, resident in Berlin, and Antonie Rosalie Agnes Kamrath, evangelical religion, born 17 Sept 1886 in Berlin, resident of Berline – Reinickendorf, Gaubetterstrasse 34, daughter of Albert Friedrich Julius Kamrath and his wife Sofia Friderike Auguste née Schultz, both resident in Berlin – Reinickendorf. Witnesses: Julius Kamrath, 59 years old, resident in Berlin Reinickendorf, and Albert Kobsch, 62 years old, resident in Berlin. Nr. 356. Berlin, Lichtenberg, the 6th of May 1919, before the registrar came the musiklehrer (music teacher) Siegmund Münzer, born 15 Jun 1862 in Lautzer in Oster Preussen, resident in Berlin, son of Karloman Münzer and his wife Helene née Güttmann, both deceased last resident in Berlin, and Erna Luise Auguste Düsterhöft née Kamrath, born 5 Feb 1885 in Naugard in Pommern, resident in Berlin, daughter of Johann Karl August Kamrath and his wife Emma Friedricke Wilhelmine née Roock, resident in ??. Witnesses: Hermann Münzer, 55 years old, resident of Berlin, and Carl Kamrath, 65 years old, resident of Angermünade, Linderstrasse 17. Nr. 314. Berlin – Reiniskendorf the 2nd October 1919, before the registrar came Friedrich Wilhelm Otto Kamrath, identified by his birth certificate, born 2 Sept 1895 in Berlin – Reiniskendorf, resident in Reiniskendorf, son of the eigentümer (farm-owner) Albert Friedrich Julius Kamrath and his wife Friedrike Auguste née Schultz, both resident in Berlin – Reiniskendorf, and Emma Maria Prehm née Lowin, evangelical religion, born 25 Mar 1893 in Berlin, resident in Berlin – Reiniskendorf, daughter of the eigentümer Friederich Wilhelm Lowin and his wife Anna Dorothea née Damerau, both resident in Berlin – Reiniskendorf. Witnesses: the eigentümer Julius Kamrath 59 years old, resident of Berlin – Reiniskendorf, and Willig Lowin, 22 years old, resident of Berlin – Reiniskendorf. Nr. 1446. Berlin the 1st of November 1919, before the registrar came the merchant Otto Heinrich Hermann Kamrath, evangelical religion, born 28 Oct 1878 in Berlin, resident in Siemensstadt, son of Adolf Hermann Wilhelm Kamrath and his wife Friedrike Wilhelmine Marie née Golze, residents in Berlin, and Helene Anna Marie Vierke, evangelical religion, born 14 May 1882 in Gollendorf, Kreis Köslin, resident of Berlin, daughter of Otto Veirke and his wife Luisa née Timm resident in Berlin. Witnesses: the pensioner Hermann Kamrath, 75 years old, resident of Berlin, and Friedriech Heinrich, 49 years old, resident of Charlottenburg. Nr. 1132. Berlin the 25th of September 1920, before the registrar came Hermann Oskar Schneider, no religion given, born 2 Dec 1874 in Königsberg in Kreis Neumark, resident in Spandau, no parents given, and Anna Helene Regina Kamrath, no religion given, born 4 Mar 1877 in Berlin, resident of Berlin, no parents given. Witnesses: Rudolf Schneider, 56 years old, resident of Berlin – Schöneberg, and Hermann Kamrath, 76 years old (b 1828), resident of Berlin – Siemsstadt.